Rising global inequality has made minimum wages a hot topic in countries around the world, as governments attempt to ensure low-paid workers have the chance to escape relative poverty. For example, the UK has also recently introduced a National Living Wage of £7.20 ($10.25) for workers aged over 25. The following chart shows the situation in 27 countries across the globe (based on data from 2013). 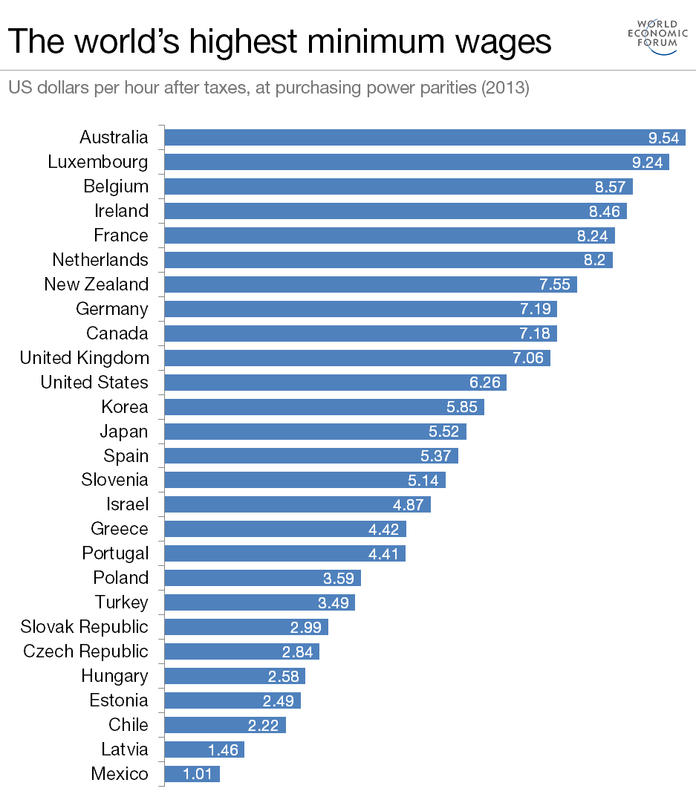 The figures have been adjusted to their post-tax rate and for purchasing power parity, in US dollars. "Ensuring that the benefits of growth reach the many rather than the few is one of the great challenges of our time, and rising wages are clearly a key driver of inclusive growth. When wages remain stagnant, imposing a minimum wage is one vehicle for driving them higher," explains Jennifer Blanke, Chief Economist at the World Economic Forum. "This of course leads to higher wages for those with jobs, but the potential downside is that employers cut jobs, leading to higher unemployment. History has shown that minimum wages that are not 'too high' have a benign effect on unemployment, and can be an effective lever (although the threshold is of course difficult to determine). Recent efforts to impose much higher minimum wages are experiments that will provide us with a better understanding of how and under what conditions they work best." How does the minimum wage affect employment? Do economists think Britain’s ‘living wage’ experiment will work?